You had been in the last year in 6 different movies. (yeah) now a lot of actresses are saying: when you're over 25, it's all over. This is... I mean this is more than you've done, isn't it? Meryl : No, I never made more then 3, I thought they were killing me with 3 when I was young and happening, you know, but... no I think it's weird. ――Did you have a dry period at some point or not? Meryl : Well... what I, you know... oh, god! (What's matter?) ... sort of things. I'm not gonna pretend, you know, we know. It was... I guess dry period... I was pregnant a lot (yeah) and then fat, you know, unemployable for a certain amount of time, but it was like... I seem to always find something to do. (6 was a lot, but... ) 6 was a lot. ――But... but let's tell them... but I haven't seen a "Mamma Mia! ", it's about a woman who had several affairs when she was in her 20s daughter, is now her 20s getting married and brings back the possible husbands and it's wonderful music instant. When you saw "Mamma Mia!" all those years ago on Broadway, having done the kind of things that I talked about the... the Chekhov's, Brecht's. Did you say "Yeah, yeah, that's for me"? ――When... when you were asked to do this, did you think "What?! Me singing, dancing, crazy!" ――Did you have any injury after do that? Whoopi : ... the park last year, you were in the park doing "Mother Courage", was right? Meryl : yeah, this is this summer, "Mamma Mia! ", we shot last summer and the summer before was "Mother Courage"
Whoopi : You were in Central Park on stage singing Mother Courage which is Brecht's play (yeah) Did you think "OK, I'm just gonna prep myself for what's coming" or did you just say "No, I've always wanted to courage, I'm gonna just throw myself at." ――They saw you sing because I saw. 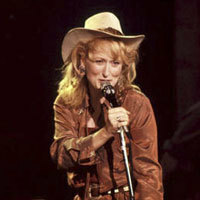 Meryl : Yeah, they saw me singing in the all... in the day off in the park. ――and you sung in these other films and you didn't never like this, this was so much fun singing scene. Meryl : but this is kind of... I'm always in different characters, you know, I'm singing sort of as the person,. ――But a lot of people don't know you it took Opera when you're a teenager. Now did you ever think I want to be an Opera singer versus being an actress? ――Your parents, they make it? ――you have 4... 3 daughter and a son, 4 kids, right? (yeah) so when you're at home and you wear spandex in this suit look and you're doing the number at home what the kids say? ――Mamie is... your daughter Mamie Gummer, she's terrific that kid, I saw her in "John Adams", I'm serious, she's wonderful! Did you encourage her to be an actress? Meryl : No, I encouraged her to be a vet, (laughter) or anything else. ――listen, Meryl's going to stick around me when we come back we're going to meet her on screen a daughter, the adorable Amanda Seyfried, stay with us.